There’s always been something magical and mystical about runes, those symbols used to form ancient alphabets. 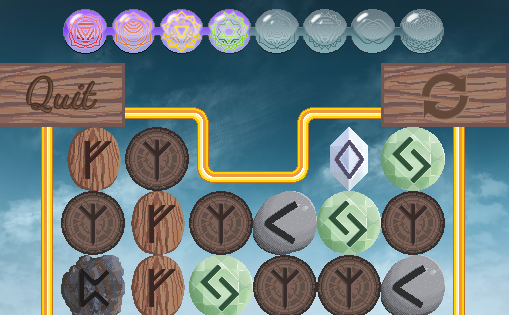 Runic letters play a central role in Zenchanted, the puzzle adventure game for Androids from Aventurine Productions. Players are presented with different rune-matching challenges as they through a series of serene landscapes. There are more than 100 levels in the game and a seemingly limitless quality of puzzles to solve. If you get stuck in one puzzle, you can sacrifice some of your earned points to refresh the playing pieces. Enchanted presents a good contrast to games based on speed or finger dexterity. The soothing music and and artwork give the game a quiet and relaxing attitude. It’s a good game to help you decompress after a stressful day. Zenchanted can be downloaded for free in the Google Play Store.